Prior to submitting a planning application, we are undertaking a public information campaign for the Greater Dublin Drainage project. We are providing information and holding public information events on the development of this vital regional project which will serve the equivalent of half a million people into the future. You are welcome to come along and find out more about the Greater Dublin Drainage Project. As a next step, Irish Water intends to submit a strategic infrastructure planning application for the Greater Dublin Drainage project to An Bord Pleanála in 2018. Following the submission of the planning application, there will be a period of statutory public consultation. Construction of the GDD wastewater treatment plant and the associated orbital sewer, pumping station and marine outfall will take approximately three years and will begin, subject to planning permission, in 2021. 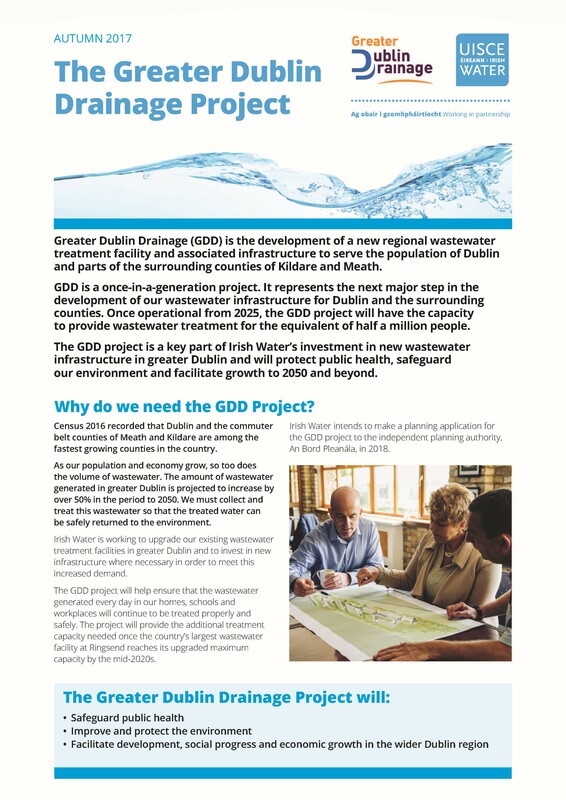 It is intended that the GDD project will become operational from 2025 and will protect public health, safeguard the environment and facilitate the development of our communities and businesses to 2050 and beyond.